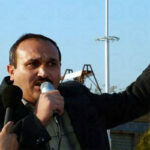 Human Rights Activists News Agency (HRANA) – Abbas Lasani, an Azerbaijani activist and former political prisoner, will not be responding to the SMS he received from Branch 2 of Tabriz Revolutionary Court. A resident of Ardabil in northwestern Iran–home to the country’s Azerbaijani ethnic minority–Lasani said that due to authorities’ spurious method of summoning him, he refused to attend the hearing scheduled for him on Tuesday, September 18th. Lasani and three other Azerbaijani activists were first arrested by Intelligence agents on July 2, 2018, a few days before an annual gathering at Babak Fort, a site that has acquired symbolic importance for Azerbaijani rallies in recent years. Prior to his arrest, he had shared a video encouraging people to attend the gathering. He was released on $3,500 USD (500 million IRR) bail July 11, 2018. Amnesty International issued a statement on August 5th of this year, calling the arrests of Azerbaijani activists “arbitrary” and unlawful, and demanded the immediate release of all individuals detained for their participation in Azerbaijani Turkic cultural gatherings. HRANA News Agency – On Sunday, August 28, 2011, intelligence and security agents stormed Abbas Lasani’s place of business.During this raid, a number of guests were beaten and detained.Abbas Lasani is an Azerbaijani political activist and leader. According to a report by Human Rights Activists News Agency (HRANA), Rahim Gholami, a well-known journalist, and Mohammad Badali are amongst those assaulted and then arrested. Previously, Abbas Lasani was detained in June 2007 for leading peaceful demonstrations in Ardebil, following a string of protests in Azerbaijan.He was sentenced to 18 months in prison and 50 lashes.After serving time, he was released. On Saturday, August 27, 2011, demonstrations were held in Ardabil and Tabriz against a proposal made by the Islamic Consultative Assembly of Iran (the Iranian Parliament) in order to address the crisis of Lake Urmia drying up fast.Peaceful demonstrations by Azerbaijani citizens turned violent when Iranian security forces interfered with the gathering to save Lake Urmia.Dozens of protesters were arrested. Abbas Khazarlu, Nasser Alilo, Asgar Mahmoudlo, Behnam Haghi, Afshin Nori, Hossein Nouri, Arsalan Hosseinzadeh and Roghieh Hosseinzadeh are amongst those detained.